Jack grew up in the Annerley area of Brisbane a student at Brisbane Grammar before graduating from UQ with a Masters degree in Physics under Frank Stacey. He travelled to Lamont-Doherty at Columbia University, where he obtained his PhD in 1976, his first appointment after that was at the ANU, flying there via New Zealand, no doubt to tell the NZ seismologists all they needed to know about NZ seismotectonics – the topic of his PhD thesis. At the ANU in Canberra he was employed as a research assistant to Prof Anton Hales, Foundation Director of the Research School of Earth Sciences, between 1973 and 1978. Whilst there Jack participated in the development and installation of a strain meter at Charters Towers under the direction of Prof Anton Hales. In 1978 Jack returned to UQ as a Research Fellow with Dr Jack Webb to help establish the Wivenhoe Dam seismic network. Much later he was also heavily involved with coordinating the upgrade of this network with Nanometrics instrumentation. 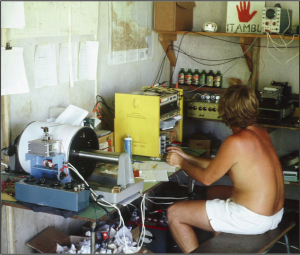 During 1973 he participated in the East Papua Crustal Survey, organised by the Bureau of Mineral Resources Geology & Geophysics (BMR now Geoscience Australia). More than 140 blasts were fired at sea north and south of East Papua to provide seismic data for the project, at a rate of about two per day. Observers, including Doug Finlayson, Clive Collins and Gary Gibson, were required to switch on their seismographs a few minutes before each blast, record for about ten minutes, then switch them off. Jack was stationed on the north coast of Papua at Tufi, and Gary Gibson was at Garaina in the Owen Stanley Ranges about 250 km to the north-west. Photo Jack; happy days at Tufi, PNG, 1973, during the East Papua Crustal Survey. Note the “refreshments” lined up on the shelf (photo provided by Doug Finlayson). He did considerable work in running large-scale crustal refraction profiles in Queensland. The fieldwork for this involved considerable driving over long distances with short stops to grab some hot pastries and an even hotter coffee which he then balanced between his legs while he was driving. Jack collected a significant amount of information on historical earthquakes in Queensland, compiled into BMR Bulletin 222, published in 1987. This data were used to improve the Queensland earthquake catalog for better earthquake hazard analyses there. He travelled to Canberra to work with Gaull and Micheal-Leiba in the mid to late 1980s, and their results were combined to produce hazard maps for Australia that were a significant input into the hazard map in AS1170.4-1993, the Earthquake Loading Code. After Dr John Webb’s death, Jack left the University of Queensland and, with Peter Hughes, established CERA, the Centre for Earthquake Research in Australia. No small claim there. He was also involved in establishing a seismometers in schools program in Queensland. Jack conducted earthquake and tsunami drills in numerous countries of the southwest Pacific region as part of the IDNDR Program 1990-2000. He was also very active with Prof Haresh Shah in the World Wide Seismic Safety Initiative, an IAEE program under the IDNDR umbrella. Jack was very well known throughout Queensland, Australia and more widely, for his work in earthquake seismology. For many years he appeared prominently in the Queensland print media. Over the last few years he had been active giving presentations to Emergency Management groups, and reinstalling the JUMP stations along the coast. Jack was a larger than life character who had an amazing and infectious enthusiasm for anything relating to earthquakes. He will be remembered by a lot of people for a lot of things – a lot knew him as Rynny while the media referred to him as “Mr Earthquake”. Jack treated everybody the same – everyone was “mate” – from the local quarry operator where he was timing a blast, the “ambos” and “fire-ies” who he was instructing, through to the departmental head where he was presenting a report. A short summary of references to his research activities is attached. Jack would have appreciated the kind words from appreciative colleagues published on the AEES list server in recent days. Jack is survived by his sons Michael and Matthew, and several grandchildren. Fitch, T.J., and Rynn, J.M.W., 1976. Inversion for Vp/Vs in shallow source regions, Geophys. J. Roy. Astr. Soc., 44, 253-267. Gaull, B.A., Michael-Leiba, M.O., and Rynn, J., 1990. Probabilistic earthquake risk maps of Australia. Australian Journal of Earth Sciences, 37, 169-187. Greenhalgh, S., Denham, D., McDougall, R., and Rynn, J.M, 1988. Magnitude-intensity relations for Australian earthquakes. Bull. Seism.Soc. Amer., 78, 374-379. Greenhalgh, S., Denham, D., McDougall, R., and Rynn, J.M, 1989. Intensity relations for Australian earthquakes. Tectonophysics, 166, 255-267. Hales, A.L., Muirhead, K.J., Rynn, J.M., and Gettrust, J.F., 1975. Upper Mantle Travel Times in Australia – A Preliminary Report, Phys. Earth Planet. Inter., 10, 109-118. Hales, A. L., and Rynn, J. M. W., 1978. A long-range, controlled source seismic profile in northern Australia. Geophysical Journal of the Royal Astronomical Society, 55, 633-644. Hales, A.L., Muirhead, K.J., and Rynn, J.M.W., 1980. A compressional velocity for the upper mantle, Tectonophysics, 63, 309-348. Jones, T. D., K. Granger, L. Cao, J. M. W. Rynn, and S. Houston (1997), Earthquake vulnerability analysis of Gladstone, Queensland: preliminary results, paper presented at AEES 97 Conference, AEES, Brisbane. Rynn, John Munro William, 1976. Seismotectonics of the Arthurs Pass region , South Island, New Zealand andregional variations in travel time ration. PhD Thesis, Columbia University, USA. Rynn, J. M., and Reid, I. D., 1983. Crustal structure of the western Arafura Sea from ocean bottom seismograph data. Journal of the Geological Society of Australia, 30, 59-74. Australian Geological Convention; Geological Society of Australia; Earth Resources in Time and Space. Abstracts – Geological Society of Australia. 15; P170-171. Rynn, J.M.W., 1987. Queensland seismic risk study. Final report to the State Government of Queensland, Queensland Mines Department publication. Rynn, J.M.W., Denham, D., Greenhalgh, S., Jones, T., Gregson, P.J., McCue, K.F. and Smith, R.S. 1987. Atlas of isoseismal maps of Australian earthquakes Part 2. Bureau of Mineral Resources, Australia, Bulletin 222. Rynn, J. M. W. (1989), Commentary on seismic risk estimates and related uncertainties for northeastern Australia, Special Paper Rep., University of Queensland, Brisbane. Rynn, J.M.W. 1990. The “passive” continental margin of eastern Australia – The myth shattered by the 1989 Newcastle earthquake: The need for more realistic earthquake estimates. Proceedings of the Pacific Rim Congress 90. The Australasian Institute of Mining and Metallurgy Publication: 679-685. Rynn, J. M. W., and others (1990), Earthquake risk in eastern Australia – lessons from Newcastle, paper presented at Newcastle Symposium, Advances in the Study of the Sydney Basin, University of Newcastle, Newcastle, 23-25 March 1990. Rynn, J. M. W., E. Brennan, P. R. Hughes, I. S. Pedersen, and H. J. Stuart (1992), The 1989 Newcastle, Australia, earthquake: the facts and the misconceptions, Bull NZNSEE, 25(2), 77-144. Rynn, John M.W. 1992. Final report on Project 3/ 91 : Earthquake zonation of urbanised areas of Australia; Phase 1 – 1992 program -Earthquake zonation for City of Sydney and environs. Centre for Earthquake Research in Australia. Indooroopilly, Qld. : Submitted through Commodore C.J. Littleton DG NDO and Chairman Australian IDNDR Co-ordination Committee. Rynn. J. and Davidson, J.. 1999 : Contemporary Assessment of Tsunami Risk and Implications for Early Warning for Australia and Its Island Territories. Science of Tsunami Hazards, Simkin, T. and Seibert, L, 1994 : “Volcanoes of the World”. 2”d edition, Smithsonian Institution Global Volcanism Program. Geoscience Press, Tucson, Arizona, USA, 394pp.